Lucille J Drozd, 90, passed away on Sunday, December 10, 2006 at Dekalb Medical Center in Decatur, Georgia. 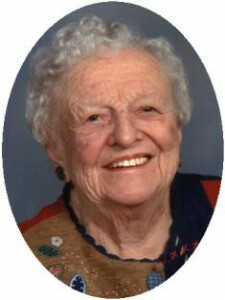 She was born in Cobb, Wisconsin on January 3, 1916 to Henry and Priscilla Jacobson Anding. After high school she attended University of Wisconsin, Madison for 2 years. She married Michael J. Drozd of Boyd, Wisconsin on March 14, 1936 in Chicago, Illinois. She was a loving wife, mother and homemaker living in Waupaca, Wisconsin until they moved to North Holden Street in Port Washington, Wisconsin in 1957. She recently moved to Atlanta, Georgia to be closer to family. Lucille was on the Advisory Board of the Judge Eghart House, a member of the Christian Woman’s Auxillary for St. Mary’s Catholic Church, a lifetime member of American Association of University Women, a volunteer for WJ Niederkorn Museum and Art Center and St. Vincent DePaul in Milwaukee. She is survived by her children Patricia (Gary) Ecklund of Decatur, Georgia and Michael D. (Karen) Drozd of Grayson, Georgia. Proud grandmother of James Ecklund, John Ecklund, Jeffrey Ecklund, Joseph Ecklund, Michelle Emerson, Kristine Edmunds, Sara Kregel, Lindsay Johnson, Joseph Johnson; great grandmother of Michael Ecklund, Michelle Ecklund, Jessica Ecklund, Kellie Ecklund, Laura Ecklund, Jennifer Ecklund, Katherine Moody, Madison Edmunds and Kane Edmunds. Further survived by her sister Lavon Beyler of Madison, Wisconsin, nieces, nephews, other relatives and friends. She was preceded in death by her parents, husband Michael J., daughter Jean Priscilla Johnson and son-in-law Robert Johnson.